This is a complete professionally drafted apron sewing pattern and tutorial that I created using a CAD software program and Publisher for the tutorial. 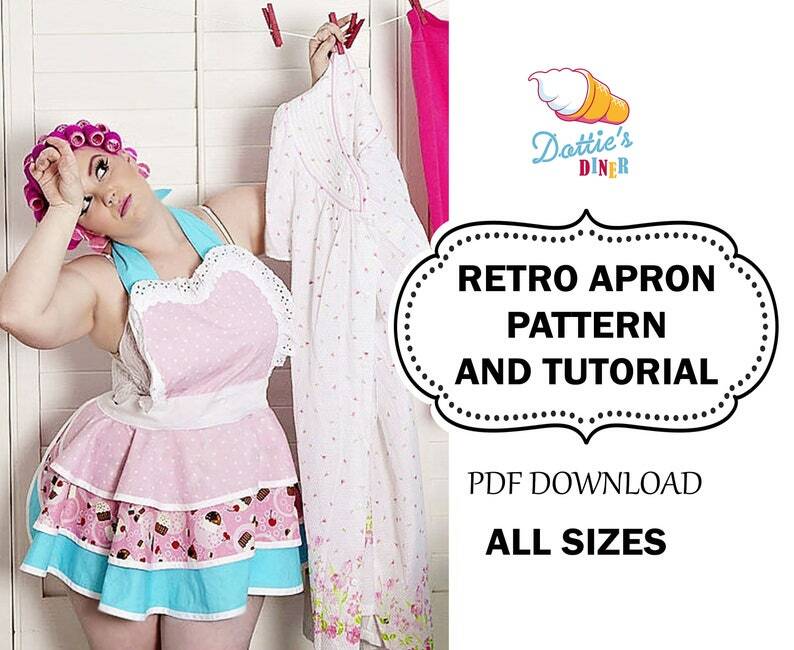 The pattern pieces are easy to download, print and tape together, and the apron is easy to sew. There are 3 layered skirts, a heart-shaped bib, a pocket, neck ties, and waist ties. The skirts are a full circle each so they are extra cute and flirty. This style is my signature Diner Waitress style that I have been making and selling here on Etsy since 2009. About easy to medium difficulty; you should have some experience with the techniques below. Q: Can I use this apron tutorial to make aprons to sell in my Etsy shop? Q: What if I can't find my digital download PDF that I purchased? Q: I see your pattern listed several times in your shop, with different “cover” photos, are they the same pattern with different pictures? A: Yes, they are the same. The reason I do this is to show the many different styles you can make. Thank you for stopping in dolls, I appreciate it!. The tutorial easy to follow and Dottie was quick to respond when I had questions! I bought this pattern and sewed up a new apron within the weekend. It looked just like the vision of my customer! I can't wait to make more!